Sometimes I think we, as humans, overcomplicate things. We pack our schedules to the gills, we insist on cutting-edge technology for the most mundane tasks, and we are constantly going, going, going. Rarely do we stop and smell the roses, and appreciate the simpler things in life. It’s amazing how some of the best things are actually the simplest of all. For example, this sushi. Goodness knows I’ve made some ridiculously complicated (though very tasty) rolls in the past couple of years that I’ve been blogging. But recently, I was reminded that sometimes, simpler is better. Who knew that the simple, almost boring combination of tuna and avocado could be so… non-boring? Exciting, even. Heck, you can get rid of the wasabi mayonnaise, and even the sesame seeds… but you must try the avocado. And. Tuna. So simple, and yet so darned addictive… never would I have dreamed that such a simple combination can be so amazing. Slice the tuna into 1 cm square sticks. Slice the avocado into slices. Mix the mayonnaise and wasabi. 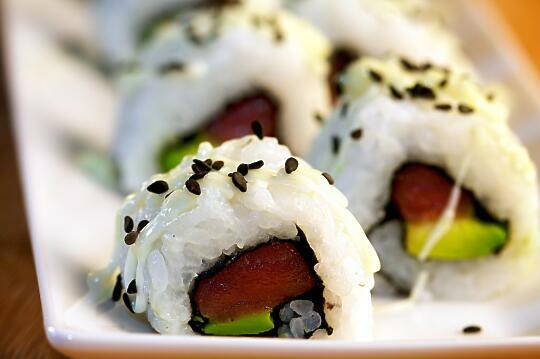 Roll the sushi inside-out, using some tuna and avocado as your fillings. 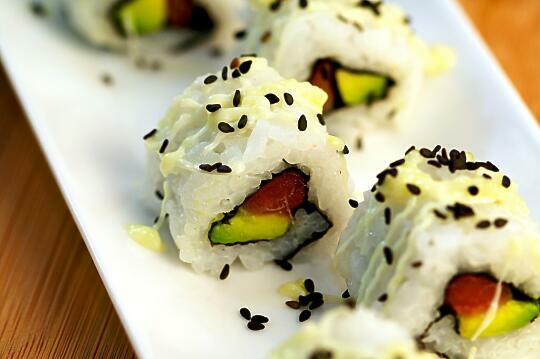 Drizzle the sushi with wasabi mayonnaise, then sprinkle with black sesame seeds. Percent Daily Values are based on a 2000 calorie diet. These values are only estimates based on the individual ingredients, and not meant to replace the advice of a medical professional. Thanks for the recipe. Though I hate to spend time in the kitchen. There’s no way I’d ever have the patience to make my own sushi from scratch. Though if someone did make it for me, I’d be the first to gobble it up. Now you got me craving it again..I might have to make a special trip to that “All you can eat” sushi place soon. I was wondering, why is this called the Kyoto Roll? Though one of the simplest sushi recipes, it is indeed one of the best. Good call reminding everyone that simplicity can be amazingly delicious. Is there any way to keep leftover rolls from going bad? So far my efforts to keep one or two for tomorrow result in inedible nori and crunchy rice. Thanks for your awesome blog… it has certainly inspired some more adventurous sushi rolling! Take care. All your photos are absolutely scrumptious. You really need to get into professional food photography (if you’re not already). mkia – That’s an excellent question, and… I have no idea. No clue whatsoever. Roderic – I agree, I was amazed at how incredible this simple roll is. Kathy – I never have a problem eating leftover rolls the next day (though we do always try to eat the rolls with sashimi the day they’re made.) Try adding extra water when you cook the rice – that might be why the rice is becoming crunchy. Danny – We’re not, but thank you! Mmmn, now I have to get some sushi! There’s a little restaurant in my mall’s food court that makes some really good sushi. Most malls I have been to have it pre-made sitting in little coolers (blegh), but this place actually makes it to order. I was starving a few minutes ago and now I’m drooling! Hurry lunch time, hurry! I just found your blog and absolutely LOVE it! 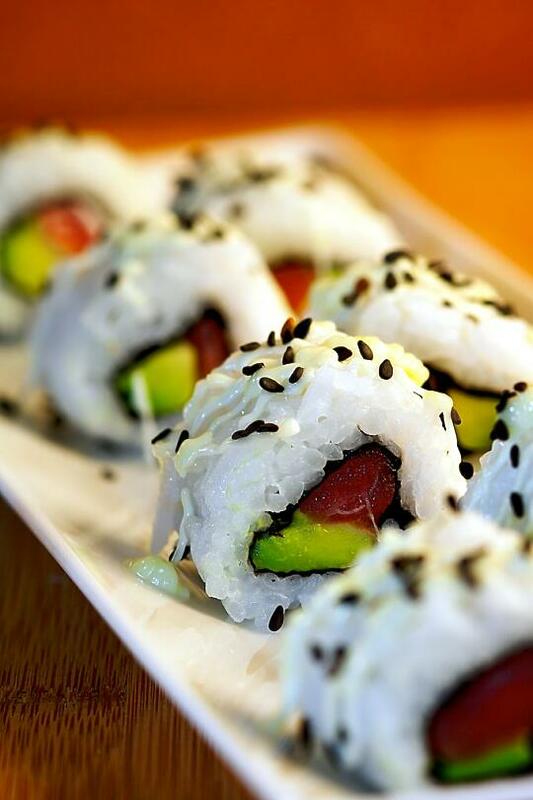 This is one of my favorite rolls ever– there’s something about tuna and avocado that you just can’t go wrong with! Can’t wait to have my own kitchen again so I can start trying some of the others, too. I went to my first sushi-making class last night, and it was a blast! I’ve been searching the internet for recipes all morning, and your site looks like a one-stop shop for all my sushi needs. I can’t wait to put my new skills to the test with some of your recipes! Thanks!